The Artist House located on Prabaramee Road, Patong Beach, Phuket Thailand. The distance from famous Patong Beach is around 900 meters and around 15-20 minutes by walk to Junceylon Shopping Mall . 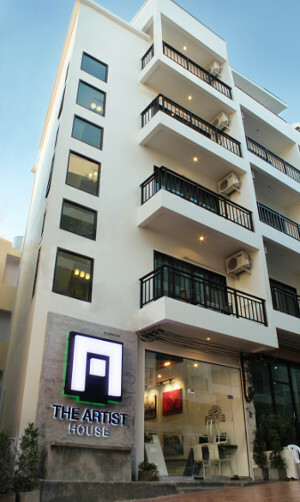 The Artist House have 5 floors and 14 rooms with local Art Gallery on the first floor. The Artist House has two room types decorated with minimal and modern design while give an artistic feeling of various arts from local artists which display in the gallery and each floor. Every room offers facilities for your comfort such as free Wi-Fi internet access, LCD TV and DVD player, drinking water and coffee, safty box, room service and 24hrs reception. Hotel name The Artist House come from artistic decoration and small size of the hotel that give a feeling of home as we think of everyone come to us is our guest. The location of the hotel is far from a chaotic and noisy so you can get a quality sleep. The Artist House is an ideal place of stay for travelers seeking comfort, convenience and art in Phuket.